I set off on my bike early, and the temp was in the low 40s. Gloves and clothing layers were helpful as I rode to the Rachel Glick Courage Center to meet with the kids. 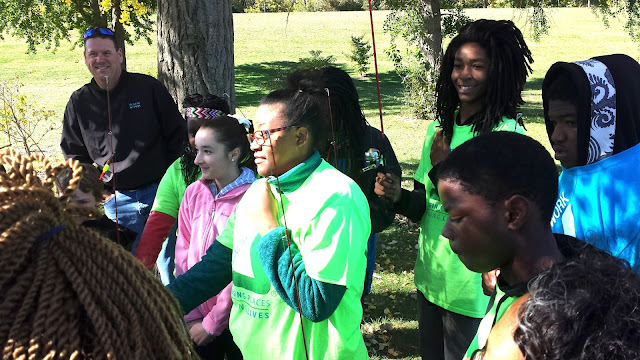 This was my second visit to the Courage Center; last week I took them on IndyGo to White Pine Wilderness Academy. These young people, with ages ranging from 8 to into their teens, live at the Courage Center for durations up to six months and beyond. They are suffering from symptoms of PTSD, or other challenges. Honestly, I can't fathom what these kids have been through, and I'm not in a position to know their stories just yet. You won't see any photos of them in this blog, because the Courage Center does not allow permission for that. While we were at White Pine last week, we discussed what our next adventure together might be. I'd long been wanting to collaborate with my friend (and fellow EEAI member) Clint Kowalik. Clint is one of the most hilarious people I know, and he is truly the most committed-to-fishing person I've ever met. 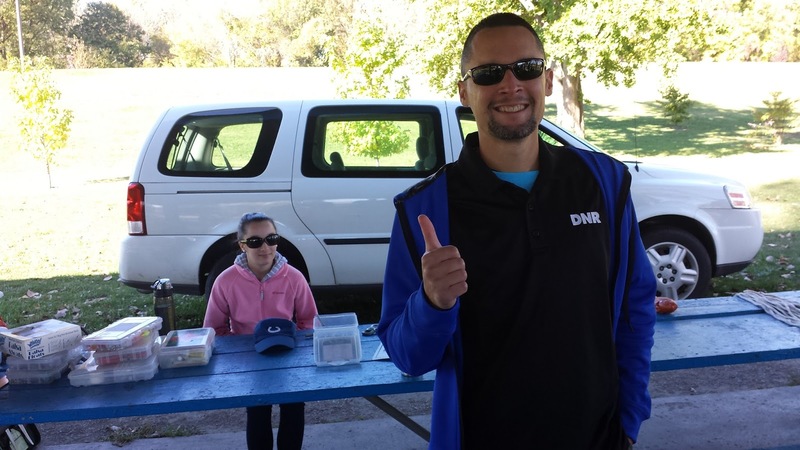 He works for DNR and runs their Go FishIN program, that gets kids — with their families — out fishing and enjoying Indiana's waterways. When I suggested to Courage Center kids that we could go fishing with Clint, they were excited and said yes. Well, some were not so excited, but would be glad to go on a field trip. Meanwhile, I attended the recent opening of Groundwork Indy, part of the national non-profit, Groundwork USA. The organization engages in on-the-ground projects that revitalize communities, training and employing a team of area teens. Phyllis Boyd heads up Groundwork Indy, and they are already cleaning up the neighborhood and planting trees. Phyllis and I had been talking about uniting Groundwork Indy our youth program, Youth Power Indiana. 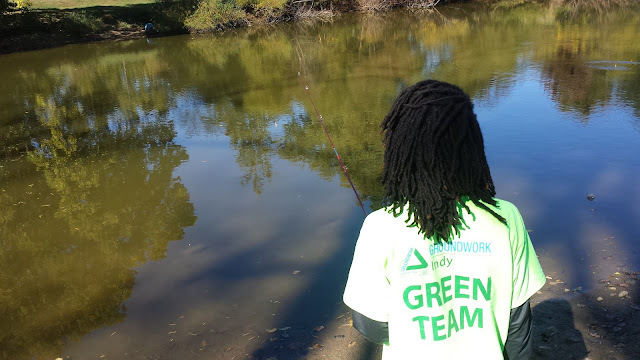 So it seemed sensible to get the Groundwork Indy teens and the Courage Center kids together to go fishing. That's why I was on my bike in the chilly morning of Friday, Oct. 16, with a large, heavy backpack on my back. Inside were my projector and computer, because doing a presentation on climate change,is part of my repertoire as I regularly take area youth on field trip adventures to various destinations — often relying on the generous contributions of bus tickets from IndyGo. You can eye some of those adventures here and here. Seven youth, three Courage Center instructors and I left the Center at 9 a.m. for a quick walk to catch the #5. We barely caught it in time. From there, it was a quick trip to Groundwork Indy, located on Burdsal Parkway, on the city's west side. A half dozen or so Groundwork teens were present and after brief introductions, I did a short presentation. In my presentations, I cover some pretty fundamental but easy-to-grasp aspects of climate science and the crisis that we face: 1) sources of carbon dioxide pollution; 2) the greenhouse effect; 3) warmer air holds more water moisture; 4) the albedo effect; 5) the rapidly melting Arctic. I added a couple elements to the standard presentation, including the recent fact that about two dozen climate scientists in Indiana wrote an open letter to the governor, saying the science is settled, it's time to get to work on climate change mitigation and adaptation, and that these scientists are at-the-ready to help. You can read that letter here. Next, it was time to walk to Riverside Park to go fishing in their pond, which is part of DNR's urban fishing program, Go FishIN in the City. It took about 15 minutes to stroll to our destination, and there was Clint, his colleague Brian, and Clint's daughter who was on break from school. Clint, with his daughter, greeting us as we arrive. Some of the items we needed to learn about fishing. Of course this is an important item as well — fish food! I knew a bit about the Go FishIN in the City project, because of my friendship with Clint. 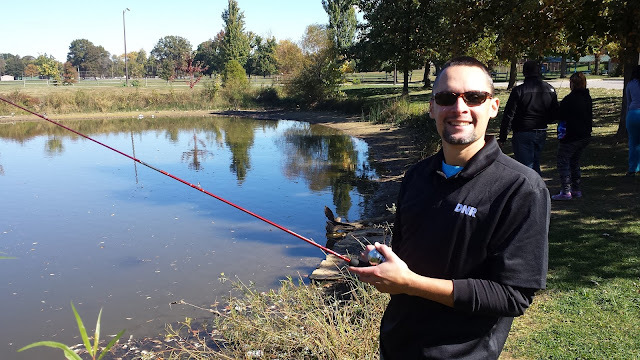 I had no idea, however, we would learn everything about the basic infrastructure of fishing. 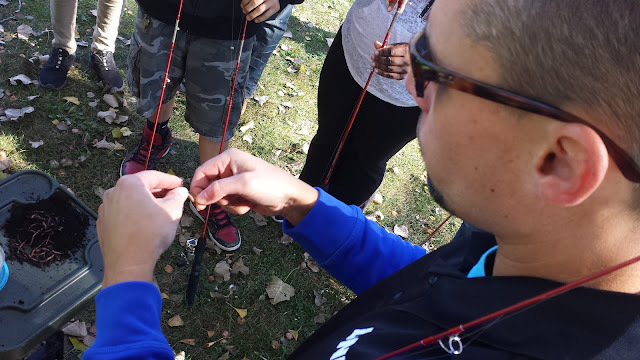 We had to put our fishing poles together, place the reel on the pole, thread the fishing line thru and then tie the fishing hook to the end of the line. We — each and every one of us — also placed the sinker on the line, as well as the brightly-colored robber. At last, it was time to take some instruction from Clint and Brian ... and then get to fishing. Many of the kids had never fished before, and it was a joy to watch them take to easily to the activity. Some kids who were experienced helped their fellow youth learn how to cast and when to reel it in. For a good while, no one caught a fish; a couple kids expressed the certainty that there were in fact no fish in this little pond. I started to get a little nervous. I spent a lot of my childhood fishing and remember the disappointment of staring at an unwavering bobber. But soon, one of the girls cried out; she'd caught a fish! Sure, it was a little dude, but it was a fish. All the kids gathered round to marvel, then redoubled their efforts to get one of their own. Over the next half hour or so, more kids caught fish. One, our youngest member at 8 years old, caught two fish. Or, perhaps it was the same fish twice, for all I know. Each time he caught a fish, I watched him run in place in utter excitement. I saw other small victories. 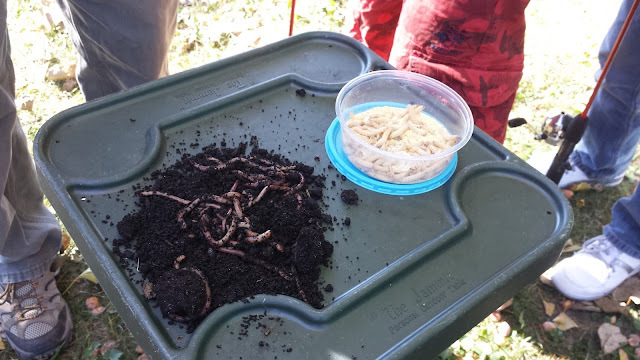 Kids who had sworn earlier in the day they would not touch a worm or a fish were doing both. I will say it again; Clint loves to fish. I feel much gratitude for everyone who helped out today, from the good people at IndyGo, to Clint, his daughter and Brian. This is the first of many FishIn trips, I guarantee, especially if Clint get some help. 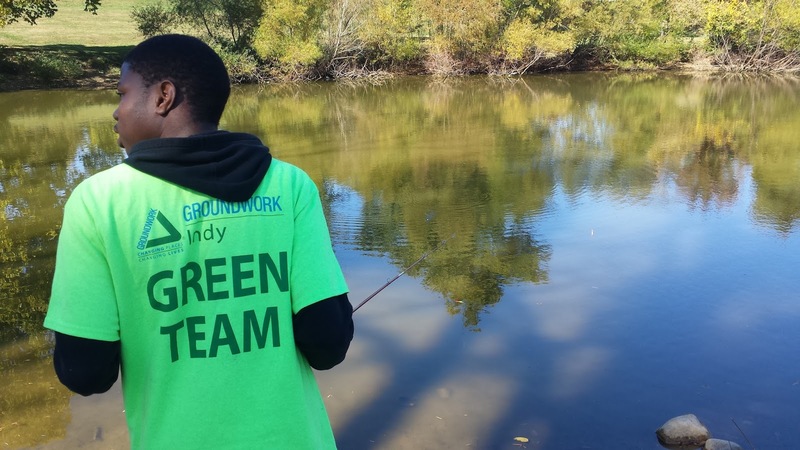 Clint wanted me to mention that he could use some volunteers, adults who love to fish who could be trained to train these kids to fish, so that more youth can enjoy the waterways of Indianapolis and beyond, with an ultimate goal of encouraging conservation and stewardship. Just send me an email and I'll be glad to introduce you to Clint. I'm excited to see what the teen workers of Groundwork Indy will do to make our city a better place. You can send me an email and I'll introduce you to Phyllis, in case you have some ideas for projects. The bus ride back was a breeze. 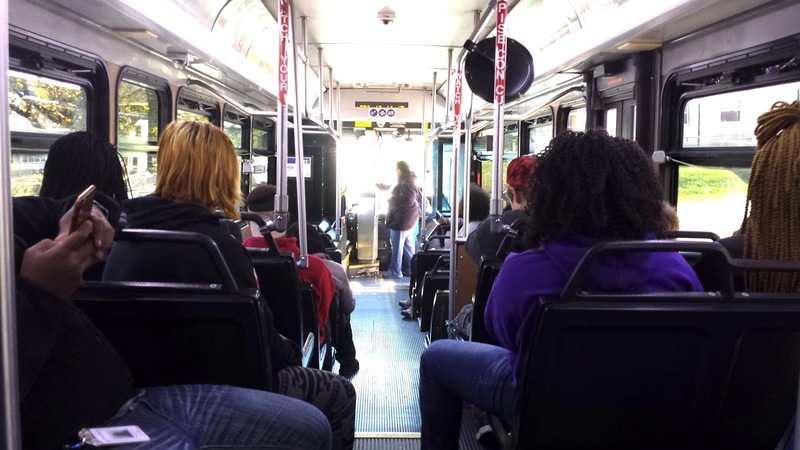 Both buses, to and from our destination were right on time, as they almost always are in my experience. And my bike ride home, backpack weighing me down, was a bit of a struggle as I hit quite the headwind. Writing this blog, downloading the pictures, makes me smile. 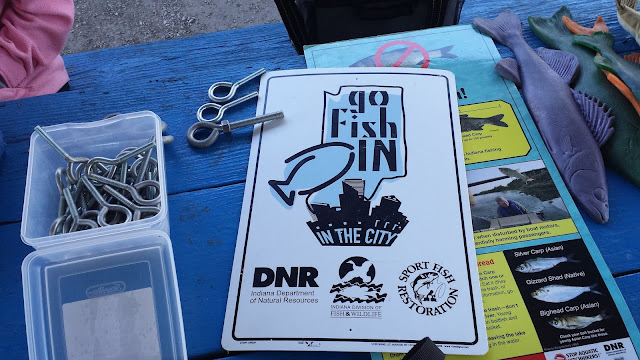 We had a little bit of everything today, climate science, hands-on activities, good exercise, a mass transit adventure, and even a couple of fish to brag about. As I said, it was an amazing day.